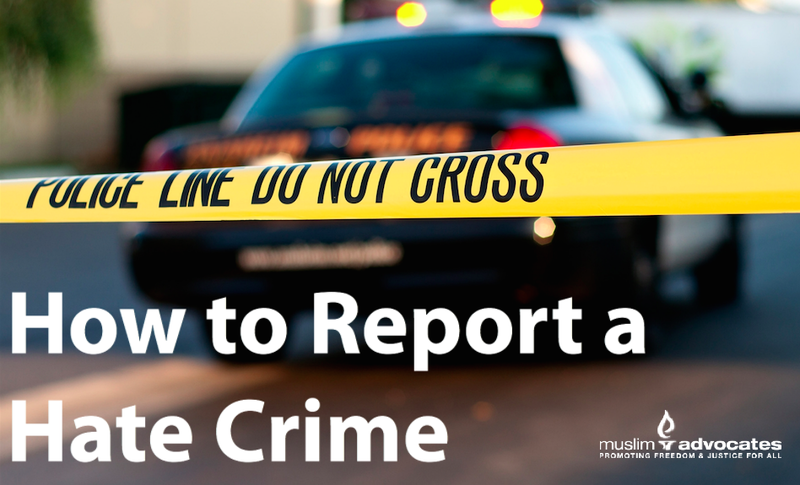 Muslim Advocates has compiled a comprehensive list of resources that can be used to report hate crimes in all 50 states and the District of Columbia. To find where to report hate crimes in your state, select your state from the list below. If you need any assistance in reporting a hate crime in your state, please contact us. Click here to view the annual FBI hate crimes statistics. On October 28, 2009, the Matthew Shepard and James Byrd, Jr. Hate Crimes Prevention Act (HCPA) was signed into law. The HCPA allows the federal government to provide assistance in the investigation and prosecution of hate crimes, and in some limited instances, allows the federal government to investigate and prosecute hate crime cases when a locality is unable or unwilling to prosecute. The HCPA also ensure that crimes targeting victims because of their race, religion, disability, ethnic origin, or sexual orientation are covered by the law. In addition to the HCPA – a federal law – most states also have their own laws to address hate crimes. If you believe you have been a victim of a hate crime, it is imperative that you report the incident to law enforcement immediately. Contact your local police department and file an incident report. In addition to filing a police report, you may report the incident to your local FBI field office for potential further investigation. You may also contact your state Attorney General’s office to inform them of the incident. If you have exhausted all of these channels and have not received a meaningful response, we want to hear from you: contact us. Please Note: This form is intended to inform the Oregon Department of Justice about potential hate crimes. This is not a substitute for filing a police report with a federal, state or local law enforcement agency. Website: saltlakecity.fbi.govPlease Note: All counties are covered by the FBI Field Office at Denver, Colorado except Yellowstone National Park which is covered by Salt Lake City, Utah. If you need help or more information on how to file a hate crime in your state, please contact us.